Crowder’s womanist reading and interpretation of Scripture uniquely centers women and mothers of color. In centering their stories, Crowder challenges a narrow biblical lens and encourages Christians to widen their knowledge of one another as well as their view of God. As a Native American woman, I especially appreciate how When Momma Speaks subverts more common biblical interpretations to apply the lens of a mother of color to historical Bible stories. 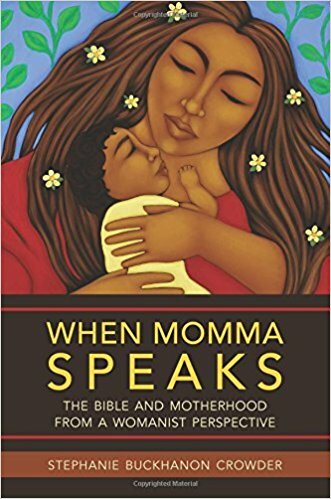 Though many of the book’s themes are specific to African American mothers, I found myself drawing many thematic parallels to Native American mothers. Native American women fight similar battles from the economic and social margins for our place in American society, and to make our womanhood and motherhood visible in a mainstream narrative that too often erases (undermines, excludes) both. The experiences of African American and Native American women are different in many ways. However, we both fight to care for our children and we both struggle to make a way in an America that marginalizes us. Native and African American women are united in their struggle from the margins. Still, each people’s struggle is unique and each culture has something unique and vital to say about God. In When Momma Speaks, Crowder argues that the maternal struggle imaged in biblical stories is much the same for mothers of color today. Mothers did and still do struggle to be godly. They do what is necessary to secure for their children the kingdom of God—even if their struggles don’t secure them their own place in society. Mothers have always had to know when to speak up and when to be silent in fighting patriarchy. Crowder compares and contrasts the experiences of Bible mothers like Mary and Elizabeth, Bathsheba, Hagar, and others with African American mothers today, tracing the evolution of motherhood culture in African American communities post-slavery. She uses the historical abuse of African American women before and after slavery in the US as a frame to understand the abuse and use of biblical women. Crowder emphasizes that though society has often abandoned women and social norms have restrained them, God has not and does not. In the stories told and re-told in this book, it is clear that while patriarchal systems disrespect the poor, often marginalized women of the Bible, God sees and knows them. They are not alone in their struggle—and this is the cry of many African American spirituals. Hagar, for example, is seen and known by God in her homelessness, and in every situation she encounters that appeared hopeless. So it is with many women of color who, at the end of their rope, still cling to a God who sees them in their distress and will not abandon them. The chapter on Mary and Elizabeth particularly resonated with me because their relationship images a connection between women of privilege and women experiencing poverty. We see through their story that women should take care of each other. Elizabeth takes Mary, the mother of Jesus, into her home and cares for her. “Those with power and prestige still need to advocate for others on the margins.” This stretches beyond the sisterhoods of women of color. Just as I must use the privilege I have in certain contexts to advocate for my African American sisters, so must non-Native women intentionally amplify the voices of women of color. Crowder reminds us of our responsibility to community in the kingdom of God, as we work to be the best mothers we can be to our children. Her lesson transcends race and culture and reaches to the very heart of who we are as people of God. When Momma Speaks advocates for a view of motherhood absent from our Bible studies and pulpits. Crowder encourages readers to connect the stories of modern women of color to the biblical stories of women who fought fiercely for their families and their faith. She believes that this story link will revolutionize how we see and treat modern mothers of color. We will learn to lean into their stories, and regard their testimonies as sacred and uniquely crafted by God. And practically, a profound respect for mothers of color will yield stronger support systems and fuller communities in the church. May we be a faith community that learns from those on the margins, from the mothers of color we have ignored for far too long.